Spaghetti squash is really a pasta-holic’s savior. It resembles pasta yet it is simply a vegetable. I often come across mac and cheese recipes and skip over them because I don’t want to engage in pasta and fake cheese dishes. This one however, caught me off guard. It was vegan mac and cheese with vegetables- the catch is that the vegan cheese wasn’t soy or nut based. I totally wanted to try this. 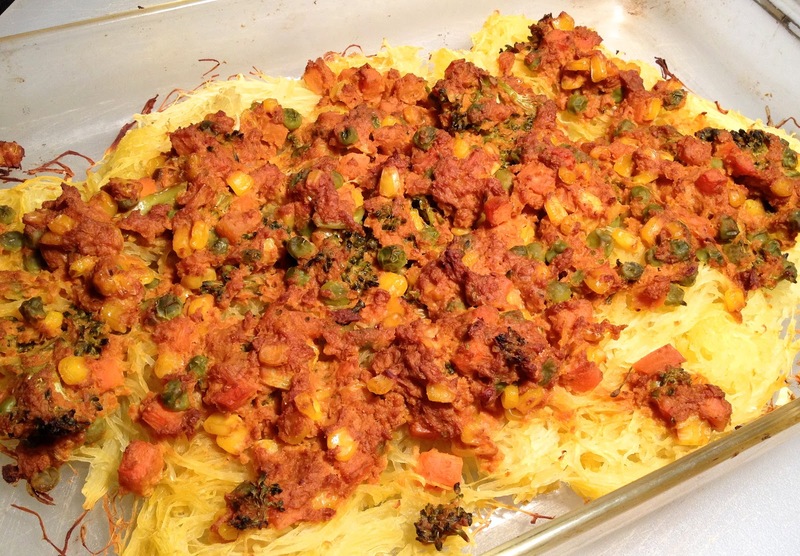 I knew I was going to make it with spaghetti squash so I was thinking something along the lines of “cheezy spaghetti”. This really should be called “my spaghetti experiment” since I had no idea how it would turn out. I read the recipe for the sauce and really couldn’t believe that it would taste like cheese. I couldn’t wait to make it. This credit for this sauce recipe goes to vegaliciousrecipes. Next I was on my way to making mac and cheese except I couldn’t hold back memories from the early freshmen college years of living off of these types of food right from my dorm room. I almost cried just thinking about it.. and no longer wondered why I gained a tremendous amount of weight that year. It was mac and cheese right out of the box. Boil the pasta and mix in the sauce. That was the only way I made it until now. So I get started mixing and stirring only to realize that this is a baking job. Patience and reading recipes.. still not my forte. What’s the difference if I mix it on the stovetop or bake it. I thought about baked ziti for a minute and then just trusted the recipe. It’s a good thing because it really did turn out pretty good. I had expected the worse but the cheese sauce was flavorful and even better after it was baked. First I made the spaghetti squash: I placed the whole spaghetti squash in a baking dish with an inch of water. I left it in the oven for an hour- actually an entire DEXTER episode to be exact. I then sliced it one time in half lengthwise. I scooped out the seeds and then pulled the spaghetti out with a fork. Then I baked the spaghetti squash with the vegetable cheese sauce layered on top. I have to admit that I had a back up plan ready to go if this sauce didn’t taste good. I had prepared a tomato based sauce with vegetables and basil. We later added the tomato sauce to the cheese sauce and it ended up tasting like a casserole.